What is QR Code Generator? A barcode is a machine-readable optical label that contains information about the item to which it is attached. A QR code (Quick Response code) is a type of two-dimensional barcode invented in 1994 by Denso Wave. Although it was first designed for the automotive industry, the QR Code system has become popular in other areas due to its fast readability and greater storage capacity compared to standard UPC barcodes. It is particularly popular in convenience-oriented applications aimed at mobile phone users; this is termed mobile tagging. A QR code consists of black square dots arranged in a square grid on a white background, which can be read by a camera and processed using appropriate software. A QR code may contain a website URL, an email address, a phone number, physical address or any other time of textual information. QR codes may contain up to 7089, 4296 or 2953 characters depending on the type of data used. "QR Code Generator" is a Chasys Draw IES image effects plug-in that allows you to add QR codes to your images. The information used to create the QR code is editable, so you can change it at any time. 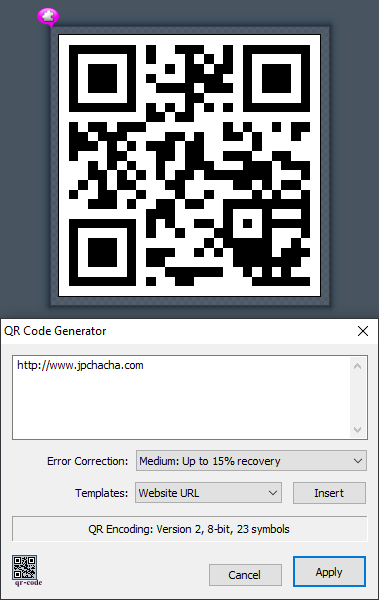 To use QR Code Generator, go to the Effects menu and select External Plug-ins. You'll be presented with a dialog box where you can choose the effects plug-in you want to use. Select "QR Code Generator" and then click "CONNECT". The plug-in will render the QR code on the current layer and present you with a dialog box where you can enter text and set various options. If you want to have the code in a separate layer (highly recommended), you'll need to create a new layer of the appropriate dimensions prior to launching the plug-in. The plug-in provides you with options for setting the level of error correction, a display for encoding details and a variety of templates for common data types. QR Code Generator supports QR versions 1 to 40. The data encoding format will be chosen automatically based on the data you enter; for example, numeric mode will be selected automatically if your input consists of numbers only. QR Code Generator sets up APPL metadata, so you can always re-edit your code by just double-clicking the layer with the Hand tool.